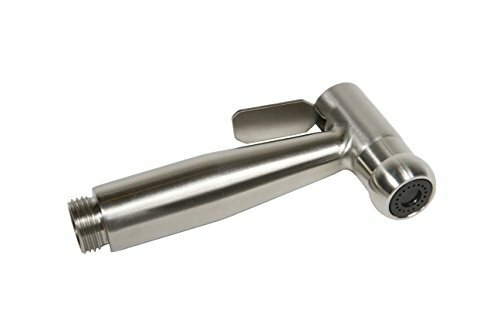 The SmarterFresh Hand Held Sprayer Head, G 1/2 inch coupling to match standard 1/2 inch hose connections. This listing EXCLUDES the T-Valve Adapter, Bidet Hose, Bidet Holder that come in other SmarterFresh bidet complete sets. This bidet sprayer simply replaces your current sprayer head. The sprayer head from SmarterFresh comes in 3 different attractive designs to fit your style preferences. The stainless steel brush nickel finish is a preferred, long lasting option that outlasts sprayers made of ABS plastic. The hand held bidet can also be used as a cloth diaper sprayer or to clean and rinse sinks and showers. Sprayer Head Must be Used w/Shut Off T-Valve Adapter to Cut Off Water Supply When Not in Use. If you have any questions about this product by SmarterFresh, contact us by completing and submitting the form below. If you are looking for a specif part number, please include it with your message.